Good thing all world leaders would never ask hard, embarrassing, questions of a President either. I didn't watch - as a non-democrat, I find the current group of candidates a joke. And so the important questions of the day remain unanswered: "Donald Trump, are you a comic book villain?" Perhaps we will never know. While debates are supposed to include tough questioning and contrast candidates and their visions, “CNBC’s moderators engaged in a series of ‘gotcha’ questions, petty and mean-spirited in tone, and designed to embarrass our candidates,” Priebus said. NBC could stand to lose major advertising revenue with the suspension of its debate broadcast rights. Hang on. NBC slashed its own throat, a predictable outcome, and now the RNC is "surprised" at the conduct of NBC? Is there a Bigger Pill than the GOP Shia Tea? What a headache these cry babies are. Now you know how we feel about Hillary. What she is....is anyone's guess..
LOL! Yeah, right. Had the shoe been on the other foot, and either CNN or FOX moderators would have been that disrespectful, rude and obnoxious and partisan Dems would have been in a total uproar of conservative bias and the outcome would have been the exactly the same. Tactically, it's a smart move by the republicans. Better to stop the difficult questions from being asked, then to have to answer the difficult questions. If you can't handle CNBC, you damn sure can't handle ISIS or Putin. Go home babies. “CNBC’s moderators engaged in a series of ‘gotcha’ questions, petty and mean-spirited in tone, and designed to embarrass our candidates,” Priebus said. Here's the point. NBC knows there's dough. The idea that the RNC is calling foul? Hey, as others have said, why don't the GOP Shia Tea just pay-per-view the entire campaign? It would sure save a lot of time and fuss. The RNC would script the debate and everything would be fine. There might be some who would even pay not to hear anything more from the yellow cake party. It was a waste of time. Nothing was learned other than seeing three moderators put in their place and quite embarrassed. Well, that's it NBC. Your questions were too mean, so we're going home. We're gonna have our own debate, one where all our friends will be there, and there will be cake, and you're NOT INVITED BECAUSE WE HATE YOU. Moreover, the Republican party must be destroyed. If NBC works in good faith as they have pledged to do, it will mark the first time NBC has ever done anything in good faith. This was actually the highest rate show in CNBC history, so I am sure executives at NBC are not happy about losing their debate. That and the embarrassment of being called out has to cost them something. The voting public was the big loser in the debate, thanks to the incredibly poor job by the moderators who chose to become active participants. Better to call out the Liberal media now before the Presidential debates when the next Candy Crowley like moderator throws in with the Democrat nominee. I can only ask, What took so long? Well, if you get moderators that will ASK questions, real substantive questions instead of partisan, schoolyard attacks and stupid, rude and snide remarks. Fantasy Football? That's a real question. Also, NBC desperately needs the ratings, so if they are smart (which is the million dollar question) they will be careful and change how to do a real moderation, but hey, I know them all too well and I knew this was going to happen. Typical of them. Sorry, as a former employee of that network, they don't. They have Al Sharpton working for them, that alone disqualifies for anything, even as news network, they're barely making 3rd place, even Duck Dynasty has higher ratings. See, as in true liberal fashion, pay, pay, pay. You guys love getting money, that might be a good idea for the next liberal debate, since they love taking other peoples money, this is something that would be good for them. Since libs love to pay money or at least take other peoples money. compared to the 2 people that were listening to the cackling woman and the Socialist with the bad posture. Well, that's it NBC. Your questions were too mean, so we're going home. Not mean, childish, which shows that the liberal mindset is equal to that of a 8 year old. Even CNN did an astounding job, They're left, but not that progressive in the outer reefer stratosphere left, they did an excelleng job, but I just don't know why the RNC would go into an event where they should have known they would be moderated by 1st graders. That was just dumb! We're gonna have our own debate, one where all our friends will be there, and there will be cake, and you're NOT INVITED BECAUSE WE HATE YOU. No, they just need a responsible network. No one watches CNBC and this is the reason NO one watches them and I mean, NO ONE. This just brings us back to when so many people complained that the media is responsible for racist incidents because they report on them, rather than the racist incidents actually being the problem. This is just the newest manifestation of the issue. Blaming the messenger. Very hard to translate: If the RNC made their fans pay to watch a debate, how many would? 2%, Max? In all seriousness. Let the Market Decide. What would the RNC pocket if they ran their "debates" on a pay-per-view basis. One million views? Two? Three million views? The real problem was, that wasn't a debate. The moderators didn't ask a single question about their policies, solutions or ideas. It was all gotcha questions. They might as well should've put Al Sharpton on, the outcome would have been exactly the same. The candidates should be able to debate any point, not just the ones that they like. The fact that they are complaining means that they don't have the confidence that they are able to answer the questions effectively. I got the feeling that the candidtates and audience weren't really interested in listening to any questions outside of their limited view. Republicans seem to live in their own little bubble world, and everyone else is biased or dead wrong. So of course they attack anyone who questions them. It's amusing to real the childish "go home crybabies" comments and the "they can't handle tough questions" opinions. These candidates are running for POTUS not a high school debate club. Very shameful of the moderators and the network. To place a twist on the cry babies comments the DNC won't consider a Fox News moderated debate! What do they fear? The GOP scheduled numerous liberal run debates. Much more courageous than the DNC. CNBC screwed up by becoming the focus on the debate. They should have just lobbed in some questions and let the Republicans destroy themselves and each other like they normally do. They essentially gave the GOP a free pass on this one. @bass4funk - I always jump straight to your comments, as when you post you use actual facts as opposed to "opinion." For ANYONE to try and make the claim that CNBC asked "difficult" question, name ONE? The were busy screwing up their facts and attempting to bait the members present into personal attacks...what professionalism! This is the first conversation I've ever read where someone tried to prove a point by accusing liberals of loving money. The candidates should be able to debate any point, not just the ones that they like. I agree! If it's a true debate, what happened the other day was a litany of attack "gotcha" moments. The fact that they are complaining means that they don't have the confidence that they are able to answer the questions effectively. No, they are complaining and with legitimate reason, again, that wasn't a debate. CNN had a debate and I'm using them, because they're a very liberal network, but NOT bomb throwing ideologues. Anderson Cooper was a pro, had NO problem with him and the others....for the most part, but what happened at CNBC, that was a joke. I got the feeling that the candidtates and audience weren't really interested in listening to any questions outside of their limited view. The audience didn't listen because it wasn't worth their time and it was a complete comical joke. Why should they listen. They wanted the moderators to ask serious questions, but this is why the people don't trust the MSM. Republicans seem to live in their own little bubble world, and everyone else is biased or dead wrong. Hmmm, how is it a bubble when people taunt you and mock you about your ability to do math, fantasy football, why build a wall and just serious dumb and benign questions. That was the bubble that liberals want to stay in. Pathetic! So of course they attack anyone who questions them. You mean, the way Hillary is doing? Ahhhh....don't you just love hypocrisy?! The Washington Post twists it nicely and convincingly, right stranger. Heh, a quiz that lets you draw your own conclusions 'twists it'. I think this pretty much goes to show the mindset of so many these days: If the facts make you look bad, it's the facts that are wrong, or the people reporting the facts. What gets me is, when the facts hit liberals, then they are not facts, they are just accusatory attacks, but when libs attack, they are perfectly legitimate questions?? Hmmm.... Selective wrangling would be a more appropriate term to use. Obama and Democrats whine incessantly about Fox News. I suppose that means Obama does not have confidence that he is able to answer their questions effectively. He is not capable of debating any point, not just the ones that he likes. That's the logic of your argument right? Republicans have had to put up with a hostile press for decades. The mainstream media is the biggest Super Pac and have been since Cronkite. Bass: I do not like to disagree with you because you are usually a very astute observer of current events, but I feel like the audience during the last debate were very tuned in to the moderators and the candidates. In the early going the audience held back when the moderators immediately began asking absurd questions and inserting themselves in the debate. But they soon began reacting when the moderators continued to show their bias and condescension. Their reactions became louder as the debate went on. After Candy Crowley's alliance with Obama during the 2012 debates the backlash seems to have led CNN to clean up their act for the last debate. Therefore I love seeing the GOP come down on NBC's bias like a ton of bricks. At the end of the day the mainstream media will come to the defense of the Democrats - CNN included. Oh yes bass. There is no double standard. A few days ago they were smearing Ben Carson......they seem to become racists. I thought we were the racists for commenting opposition for the Obama's administration. Evidently only a conservative can be racist. Liberals tell us that all the time yet liberal policies suppress the minorities. I think I get what you are saying here. Something along the lines of "I know you are, but what am I?". Obama and Democrats whine incessantly about Fox News. Democrats regularly point out out inconsistencies, and incorrect information 'reported' by Faux news. I guess when you can't deny the facts, it's easier to try to discredit the claim by calling it 'whining'. As for Obama - I only ever remember hearing him make one comment on Fox - yet you call this incessant whining. Bit of a discrepancy there no? Republicans have had to put up with a hostile press for decades. To do a bass: Faux news is hostile against the Democrats. Same thing would you not agree? It was all gotcha questions. That complaint again. Last time I heard the term in relation to Republican hopefuls, it was applied to this question: "What newspapers and magazines did you regularly read before you were tapped for this to stay informed and to understand the world?". The kind of question you might be asked in one form or another in a job interview, or a college admission interview, or for a school essay at the age of 12. The kind of question you should, if you're running for public office, be able to handle with ease, either by simply answering it or deflecting it in a sufficiently skillful way. Governor John Kasich, you’ve called for abolishing the Export Import Bank, which provides subsidies to help American companies compete with overseas competitors. You call that corporate welfare. One of the largest newspapers in your state wrote an editorial, said they found that strange, writing, that if that’s corporate welfare, what does Kasich call the millions of dollars in financial incentives doled out to attract or retain jobs by his development effort — jobs Ohio. If subsidies are good enough for Ohio companies, why aren’t they good enough for companies trying to compete overseas? From the answer, which for reasons of length I won't quote here, he didn't exactly distinguish himself - or let's say, he didn't really address the question. That's okay, he quickly moved to deflection, which while not especially honest or informative, is a time-honoured tactic for all politicians who have to answer questions on the spot. I’ve got a question for — for Dr. Carson. [About Medicare] Yes. You’ve said that you would like to replace Medicare with a system of individual family savings accounts, so that families could cover their own expenses. Obviously, that would be a very controversial idea. Explain how that would work, exactly. The answer to this was pitiful (in my opinion), and again, not an answer to the actual question. So you have a neurosurgeon from one of the most prestigious medical institutions in the country who doesn't even answer a question related to healthcare directly or appropriately. But the thing is, even if you disagree with my opinion of his response, and agreed with every word of his answer, it should be almost impossible to look on it as a gotcha question. Instead, it is an opportunity to explain a policy that he advocated. He ducked that opportunity. Which is of course his right, but then neither he nor you could justifiably complain about a question of that nature. Accusations of racism against Obama are from things like blatant disrespect to a sitting president such as calling him a liar during a speech (https://www.youtube.com/watch?v=fnF4rQQktfs), openly carrying firearms to his speeches (http://edition.cnn.com/2009/POLITICS/08/17/obama.protest.rifle/), poking their finger in his face (http://www.eurweb.com/wp-content/uploads/2012/01/Jan-Brewer-and-Barack-Obama.jpg), calling him a Muslim (http://edition.cnn.com/2015/09/18/politics/trump-obama-muslim-birther/), the birthers etc. No sitting president was ever disrespected like this until the president was black. No one on the other hand has disrespected Carson like this. He has simply been called out for things he has said. Not even remotely racist. Anything to the contrary is just people that are bitter for having their racism against Obama pointed out. I didn't watch any of the debates. Did the moderators in the Democratic debates throw soft pitches to the Democrats? So, you group ALL who oppose the current POTUS policies into one? Very closed minded now I understand why that bubble contains a different thought pattern. As for the Carson comments made....more than a few reiterated fabrications from the bias media. Not words from Carson himself. Again....the bubble containment syndrome. Just as the 'clever' moderators attempted to spoon feed the debate with there own agenda the brilliant candidates shut them up, pure them in their place and made look like middle school children! And ABC issued an apology. The moderator was not letting him speak his answer. So, you group ALL who oppose the current POTUS policies into one? Are you referring to me? If so, not at all. It's not the opposition to policies that is racist, it's their actions towards the president that is racist. They show him a disrespect that has never been shown against a white president. Your logic is lost on me - "it's their actions towards the president that is racist"
What the hell does his race have to with "disrespect?" 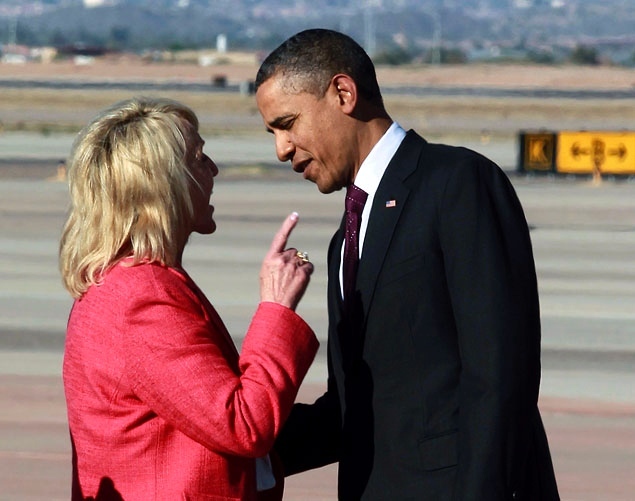 I'm not denying the instances you have cited as "disrespectful," but how is Jan Brewer wagging her finger "racist?" Was she shelling out racists taunts? Did she use inappropriate racial slurs? Because no one did it until the president was black. I watched them both back to back two days ago. Anderson was tuff and the questions were good enough for the general public, but not for me personally. Deal with the problems of the country, not the party. I haven't come across anyone else who regards this crop of candidates as 'brilliant'. "Gotcha Questions" are good actually. It shows the flaws of whoever is answering them. In that regard, these should be all the type of questions being asked in both Democratic and Republican debates. If there's no "gotcha! ", then that candidate is good. "Because no one did it until the president was black." Was this the first time anyone was disrespectful to a President? How about the guy that threw a shoe at Bush? Or the numerous implications that Dan Quayle (and Bush) were morons? Do you know who Jimmy Carter's brother was? You really need to redefine your definition of "racism." Blatant disrespect such as the examples I gave. The guy with the shoe was American? News to me. You really need to admit it when it exists. Strangerland: Because no one did it until the president was black. You're just too young to remember. The elder Clinton's campaign sent a heckler dressed as a cigarette to the elder Bush's speech, possibly to distract from Gore's tobacco ties. And here's 'Top 10 presidential speeches interrupt by hecklers'. None of the examples I pointed out was hecklers from the local people. Well actually the gun carrier was a local person. But the rest were all republican politicians. So Trump is a good candidate since he immediately threw it back in his face? While Hillary is bad since she would deflect and not answer the question asked? Watch the Dems debate, many times Anderson had to re-ask the question saying "but you never answered the question". Only sanders did not do this. Strangerland: None of the examples I pointed out was hecklers from the local people. Well actually the gun carrier was a local person. But the rest were all republican politicians. Maybe the politicians remembered the cigarette. Uh, Strangerland, stop equating "disrespectful" with "racism"
CNBC is a conservative business station that launched the Tea Party movement. What is going on here is that while the republicans like to dish it out they are such babies that when they are challenged on their lies they cry. Hillary has more balls that all the republican candidates combined, well not counting the woman HP fired. She has a lot of balls to run for President after failing her job and losing her only campaign in a wipe out. I'm not. The disrespect is a result of the racism, they aren't the same. Racism is the problem, the disrespect is the symptom. If Obama were white, the people who have been as blatantly disrespectful to him as they have, would not have been so disrespectful. Let's talk about these so-called 'gotcha' questions that the 'liberal' media uses to sink conservative candidates or get them to diss their competitors on stage. Which of the following are from the CNBC debate? A -- "How can you win in 2016 when you're such a divisive figure?" B -- "Your critics say that your inexperience shows. [LISTS STATEMENTS] Aren't these basic mistakes, and don't they raise legitimate questions about whether you are ready to be president?" C -- "Could you please address [CANDIDATE] across the stage here, and explain to him why you, someone who has never held executive office, are better prepared to be president than he is?" If you answered "none", you're correct! All of these questions were asked of Republican candidates at the Fox News debate. The first was asked of Cruz, the second of Carson, and the third of Rubio. The question Fox asked Cruz is substantially no different than the one CNBC asked him, yet Cruz used the opportunity at the CNBC debate to declare war on the 'liberal media'. Cruz is nothing more than a snake oil salesman. The New Yorker has a brief but interesting take on this, both in general and specifically regarding the question posed to Rubio about his ability to handle money - which he brushed off as bashing and never answered. Methinks he'll have plenty more opportunities to answer it as the race continues. Have you seen the stats on the number of Republicans who believe he is a Muslim born in Kenya? A memorable example was McCain telling a woman she was wrong for not liking Obama because he is 'an Arab'. Bassy boy: Oh really, "Obama can't even handle FOX? What in the world are you talking about?!! ROFL." I recall Obama having an one hour interview with O'Reilly, and having to answer the punk from Fox in White House question and answers all the time. As for the low-quality questions, well, I think Trump and the rest of the crew has set THE STANDARD, by referring to Fox's Kelly just having a period when she asked a legitimate question about Trump being a woman-hater. Keep in mind, that the question came from the TOP of Fox's new staff, if not Ailes himself. Kelly just reads stuff! And FOX is NOT a liberal station! And ByteCarp, REALLY? "CNBC got caught being partisan, and now they just lost a boatload of revenue...I'm sure the shareholders are very pleased...oh wait they are all 1%ers, right...so who cares..."
TOO FUNNY! Oh, like the republicans are NOT in favor and NOT doing the very bidding of the 1%ers. REALLY? What planet are you from? If there were any "difficult" or leading questions that might have been "biased" you know what these repugs could have done? SHOWN a little CLASS and pointed it out and moved ON to a real issue. LIKE BERNIE SANDERS does ALL THE TIME. Too much to expect from repugs, who like Huckabee and Jindal and others who just a few days ago called for the death penalty for gays. Back to the dark ages with these thugs. As for Obama - I only ever remember hearing him make one comment on Fox - yet you call this incessant whining. Bit of a discrepancy there no? Obama refuses to do interviews with Fox or any conservative media outlet. He can get away with that because there are so many Liberal news outlets and the Left covers for him by never pointing out his inability to deal with opinions other than his own. Democrats regularly point out out inconsistencies, and incorrect information 'reported' by Faux news. Not only that but the Democrats' super rich backers fund an entire organization to monitor Fox News and spin any statement against the party line to the ultimate Super Pac, the mainstream media. The Democrats, like all totalitarians, understand the importance of winning the propaganda war. Fox serves the much needed role of speaking truth to power. When Democrats are in power, the mostly Leftist media tend to support them because they agree with the them. When Republicans are in power, they tend to attack them because they do not agree with their politics. All the while they claim to be neutral and non-partisan. No one believes the media is neutral. Studies always find bias in the media. When reporters are asked their political affiliation they are overwhelmingly Democrat. I agree. Isn't it bizarre when the likes of Fox who 'speak the truth to power' according to Wolfpack ( perhaps he can explain what that strange expression means ) call Obama a socialist? I've heard 'socialist tyrant' on this site. Evidently the super rich seem quite comfortable with this radical Trotskyite. Just negative sounding words words thrown out to partisans who take them up like parrots and shriek them when you take the sheet off the cage. CNBC is supposed to be a business and financial news media outlet. Debate moderators are supposed to be impartial. The alleged moderators chosen by CNBC were politically biased, childish, and chose to inject themselves into the debate. That was wrong, wrong, wrong. The CNBC moderators embarrassed themselves and their network. Shame on CNBC. Because of this, the GOP has now chosen to suspend their broadcast partnership with NBC. No one should be expected to partner with a dishonest and truculent news organization. It's now up to NBC to raise their standards if they wish to get paid to broadcast political debates. The DNC is scheduled on no conservative networks or moderators the GOP is scheduled on both conservative and liberal. Why is that? Is it stupidity or is it to play it safe? Just watch MSNBC programs. They are real people and not paid actors and actresses. And they actually believe what the report and comment on. CNBC did flop this one and the public made it known. For the GOP to suspend further debates on the bias network is their choice and right. The debates can bring a nice profit into a network for the two hours. Candy Crowley got away with it almost 4 years ago. She had no right to state a false comment/correction. I'm gonna take my ball and bat and go home ! Wah, wah, wah. Then you haven't been paying attention, Obama has been constantly complaining about FOX when he does something and he gets challenged on it, because they didn't lick his boots and bow to the almighty like the rest of the MSM. Which really looks bad and reflects poorly on him. And of course it makes him look like a wimp complaining like that. Obama is just not used to people having a different opinion or facts from him. This is why the guy never learns. Faux news is hostile against the Democrats. Same thing would you not agree? No, not at all, but they do call out liberal hypocrisy. I did a 3 month internship with FOX in 1999 and know a lot of people and met some of the big guys and I can tell you, they have a lot of liberals working there, a lot. I would call them reasonable, sensible and logical realistic liberals, had the biggest respect for them, not loud, insulting, rude or bombastic. at NBC, you could count on your finger the conservatives that worked there, they hated to be challenged, it was always our way or the highway, it was just horrible and the climate has worsened since I left. That's not what I was talking about and you know it. Again, CNN did a very good job, were very professional and asked tough questions, the questions that CNBC were asking for the most part were condescending and I don't expect anyone that that is partisan or unwilling to see the truth to accept it. You don't hear anyone complaining about the CNN debate? Even the audience were disgusted with these gotcha questions which OVERSHADOWED the real questions that the moderators were asking and that's bad. CNBC has become the cancerous joke of NBC which already has lost all credibility in the world of cable NM. CNBC bit a big one on this and they desperately need the ratings to keep a pulse going and they just shot themselves in the foot for that stunt. Why, oh why is is so difficult for you libs to see the obvious, but want to go around the core issues? No one is talking about the legitimate questions that were asked, but these? These are NOT professional questions. Are you serious? GTFO That was a complete joke! Marco Rubio, You’ve been a young man in a hurry ever since you won your first election in your 20s. You’ve had a big accomplishment in the Senate, an immigration bill providing a path to citizenship the conservatives in your party hate, and even you don’t support anymore. Now, you’re skipping more votes than any senator to run for president. Why not slow down, get a few more things done first or least finish what you start? Obama had ZERO experience (but maybe that's why now in hindsight and deep down, liberals know what an exploding cigar that was to elect someone like the Sainted one) so how does that make him different. Rubio at least worked on many legislations, didn't just vote present, smart, Hispanic. Why not go on his record and accomplishes? But then again, that would look like your sucking up to him, can't have that! That is a dumb question that the moderators didn't need to ask. Stick to the questions that mean something to the people, if the candidates want to boast about themselves to one another, then let them do it and the audience and the voters will decide what and who they think is electable or credible NOT the media. Ahem, did you forget, the pummeling Megyn got? Other than that, the other moderators did a good job as well as CNN, but not in this case. One thing I do know for a fact. The next morning in the CNBC briefing room, there was a lot of finger pointing, yelling and cursing going on that is for certain. They knew they screwed up and that they're in serious hot water now. No, asking Trump he has about as much chance of slashing the deficit as he does of flying off the podium and if Carson can do Math? WTF? I want to see if any of the moderators have the intelligence to separate conjoined twins. But then again, they're just CNBC moderators that blew it and they really need the ratings at this point, John Harwood is an idiot, not to mention arrogant and I don't know why. Met the guy once and thought then, he was a real slime ball and when I saw that he was going to be a moderator for this, let's say, I had a lot of apprehensions and felt this thing was going to fall apart. I was right. and Hoffman is definitely NOT a happy man for sure. 110% agreed. That network lost all credibility it had and it wasn't that much to begin with. Can someone really think they know so much and still be completely oblivious to their own ignorance? What were they expecting? In the previous debates it was all fun and games. NOW!? There's some flap over "unprofessional" moderation? Rump tossed the whole thing into the gutter and the RNC never got control back. The whole sham is hurting the brand and further splintering an already offended grassroots Republicans. Wish some of the liberals would take that advice. A real debate on the issues and not snide, liberal hit jobs in the hope of possibly getting higher ratings. In the previous debates it was all fun and games. NOW!? No, the last 2 were very good, just pretty much Trump didn't like it because.....well, we all know Trump. There's some flap over "unprofessional" moderation? Exactly, too much of it, that's why the repercussions of that is no reverberating through the halls of CNBC management. Hoffman is probably taking his heart medication by now. Rump tossed the whole thing into the gutter and the RNC never got control back. Sorry, but it wasn't Trump, not at all. It was pretty much John Harwood, that started the gutter attacks. The whole sham is hurting the brand and further splintering an already offended grassroots Republicans. Doesn't matter. At this point, the people can decide what they want and that's Trump, Carson and now Rubio and Cruz at this point. Whatever the media thinks is irrelevant at this point and it showed again the other day why the people don't trust the liberal MSM. Cruz was asked about the deficit ceiling and whether he and his friends would try to shut down the government again. That is what triggered his crybaby response. I mean, give me a break. I disagree, but I'm not partisan. Wipeout, that's not what I was talking about and you know it. What an odd thing to say. It's exactly what you were talking about. Here it is again: "The moderators didn't ask a single question about their policies, solutions or ideas. It was all gotcha questions." Isn't it bizarre when the likes of Fox who 'speak the truth to power' according to Wolfpack ( perhaps he can explain what that strange expression means ) call Obama a socialist? Conservatives call Obama a Socialist because he is a Socialist. I don't understand why Dem's cannot bring themselves to come out of the closet as Senator Sanders has. When Hillary Clinton was asked she was unable to define the difference between Socialism and Progressivism. Progressivism is the American equivalent to European Socialism. Why be ashamed of what you are unless you are hiding something? Most on the Left were well versed in "talking truth to power" when their cultural and political values were not ascendant. Well, now they are the dominant culture. America is a very socially Left society and becoming ever more incrementally Socialist. And like any dominant entity they oppress opposing points of view. This is manifest in political correctness and attempts to delegitimize opposing points of view as racist, sexist, etc. At least on the right they have a Libertarian strain that wants to be left free from government dominance. Progressives do not allow for that. They do not provide people the right to choose their own path. You must obey what the Social Democrats decide for the collective. One cannot opt out even if it violates their conscience. If you do not obey you are coerced through taxation, penalties, loss of employment, or even jail (or the threat of it). The further along that Progressivism evolves in America the more extreme the polarization will become and the more the need for pointing out Progressivism totalitarian tendencies are needed. It is why the first amendment is so important and why the Left's attacks on it are such a huge threat to democracy. They need to have a free-for-all: Pre-primary mixed debate of Republicans and Democrats, moderated by a mix from Fox News and MSNBC. Fox would cut them all to pieces! My guess is we will never find out whether Fox would expose them or not. The Dems have no interest in debating on a network that doesn't tow the party line. No they don't! Which resonates with truthfulness. The DNC pursues false dreams. What were some of these problematic questions anyway? Lesson. Never schedule in a Unix in thr weed state on MLB WS game Day. @dcog9065... Ginger or Mary Ann? @dcog9065NOV. 02, 2015 - 10:58AM JST What were some of these problematic questions anyway? It is ridiculous that the Reps did not suspend this contract before. In essence, until now they agreed to have their debates moderated by activists of the opposing party. How naive can you get? I am not particularly invested in US party politics (I think both parties have it sadly wrong on major issues), but to deny that the mainstream media alphabet soup is solidly in bed with one particular party is just denying reality. lied about west point? he's gone too far! Anyways, I stand with Ben Carson. The Washington Monument was obviously built by George Washington to store hemp. Read your Masonic bible, fools.